This is the first volume in a series containing fascinating tales of long-forgotten rural life in Hemyock and the Blackdown Hills. This series is based largely on personal interviews conducted in 1995; edited & republished in electronic format on Kindle, to raise funds for Hemyock&apos;s Blackdown Support Group Charity, which does so much to help frail & elderly residents. It is equivalent to about 20 A5 pages. 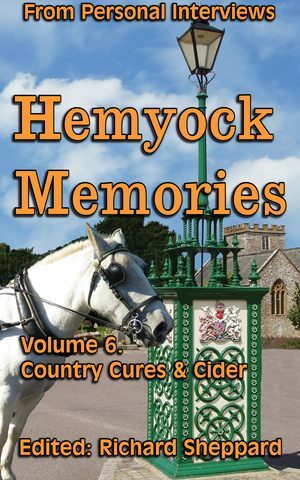 "Country Cures & Cider" Volume 6 of Hemyock Memories. In our modern world with its instant communications and 24/7 TV news coverage, it&apos;s hard to imagine rural Devon life before the 1940s when many people in Hemyock seldom ventured farther than the nearby towns; almost anything necessary could be made, bought or repaired locally; and where most activities had been contained within the village. This was long before the UK&apos;s National Health Service was founded: People, especially in rural areas such as Hemyock, relied on traditional cures & remedies, even for quite serious medical problems & injuries. It includes the story of healing the eye of a valuable Arab colt horse, using just ordinary sugar; Also cider-making at Hemyock Castle Farm. This book relates some traditional remedies for humans and horses; as well as the important part that cider and cider-making played in village life.